Why you shouldn’t rely on NPS alone? In the services industry Net promoter Score (NPS) is a widely used metric for measuring the customer satisfaction based on whether he/she is willing to recommend the store/service to anyone or not. NPS is based on a direct question: How likely is it that you would recommend our company/product/service to a friend or colleague? The response to this question is a number from 1 to 10, with a score of 9-10 is considered as Loyal Customers and a score of 0-6 is considered as Unhappy Customers. NPS has its own criticisms. Russel Hayes in 2008 recommended that the likelihood to recommend is not a measure of business growth or customer loyalty, and it does not provide any more information on what is good and what is wrong, why exactly the customer is happy and why exactly the customers is not happy. 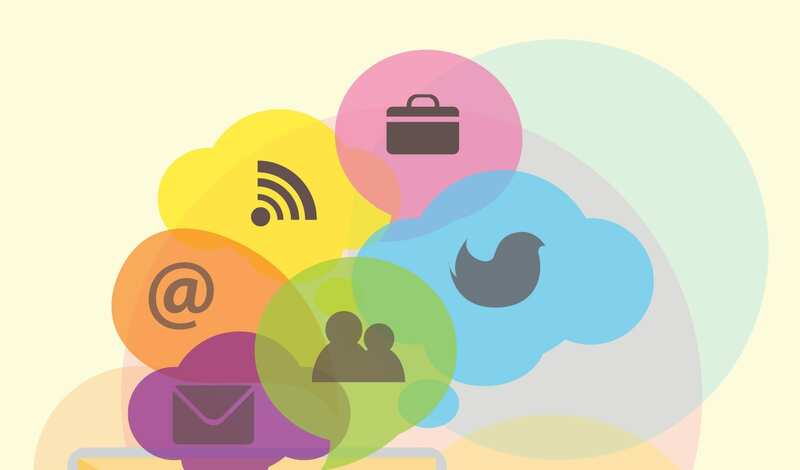 With the availability of so many platforms across the internet for customers to share, connect and interact with the brands and with individuals, there is a plethora of information getting piled up on a lot of services-review sites. Yelp is a very good example of restaurant reviews and ratings. A lot of reviews of Hotels, Restaurant and resorts can be found on Tripadvisor. There are specific sites for people to write a review on specific services, and different platforms are popular in different parts of the world. For example, in USA Yelp is fairly popular for restaurant reviews, while in India this role is played by Zomato. Also, Tripadvisor has a bias built in for travelers as it is used very widely by the travelling community. All these sites have hundreds of reviews for a huge number of businesses. So are these reviews helpful? Yes, already a lot of businesses are tracking these reviews to understand feedback from customers, and a lot of customers are using these reviews to select the services or the product. But, there are cases where thousands of customers are writing the reviews about a single restaurant, and there is no way the business owner can go through all of them to find about the overall good things and bad things about his/her business without investing a lot of time and resources. The NPS only uses one metric, but there is a huge information already stored in these reviews which are richer in content, and can tell you exactly why the customer is happy and why the customer is unhappy – Something the NPS can’t tell but the CRS can. So why is CRS not used widely? The answer is because of the difficulty to go through thousands of text-based reviews. NPS will give you just one number at the end, which you can get out on a calculator. The problem with the reviews is the difficulty in analyzing them and extracting information, understanding customer emotion and the polarity of the review (positive/negative). This is something which only a human mind can do, and is not a job for machines. With the advancement in data sciences and Natural Language Processing, this is now possible to some extent. Of course the computer cannot find out the difference between a happy “I am Fine” and a sarcastic “I am Fine”, but it can be 75%-80% accurate in predicting the sentiment in a sentence or a paragraph as compared to Human Brain which does it at 100% accuracy. This is good enough for a predictor model, and skimming through thousands of documents/reviews in a matter of seconds. Disclaimer : All information (reviews, customer name & location) is already present in public domain over the internet on review sites, no personal data or data from any other source has been used. We do not claim the accuracy of Name/Location information. The reviews are personal opinion of the writers and not of Tripadvisor LLC or Capillary Technologies Pvt. Ltd. The analysis starts with user-generated data collection, which is obtained by scraping the reviews of the particular store from the website Tripadvisor.com. 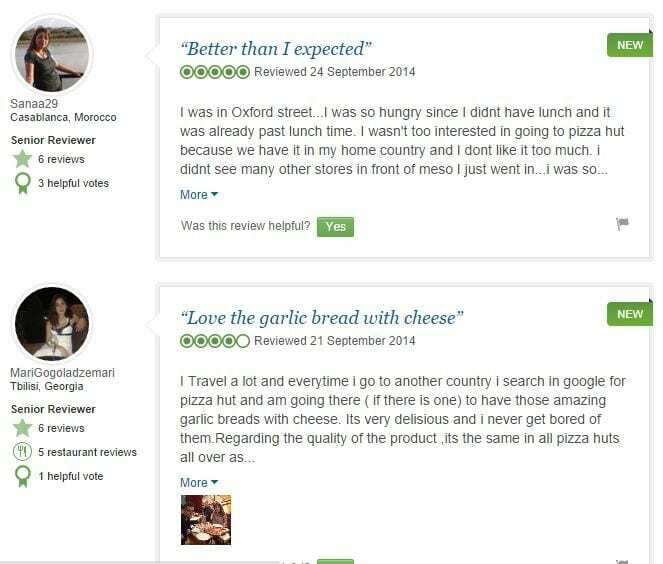 The reviews are collected along with the information of reviewers (Name, location and reviewer ranking according to Tripadvisor). A lot of other information about the users can be obtained by scraping through their profile pages but we are skipping this for simplicity. The customers are from all parts of the world (this is a bias built in since the website is a Treveller-focussed website). 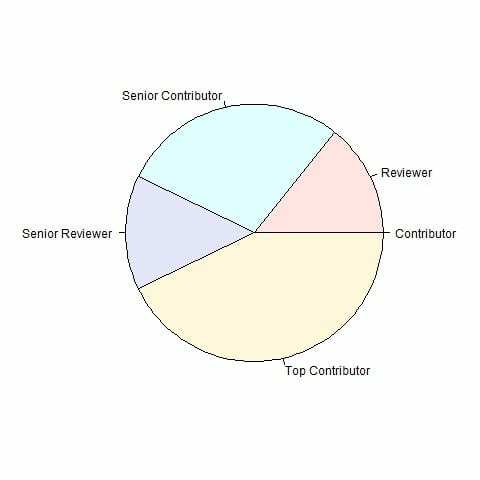 An analysis of locations can show where the reviewers reside. 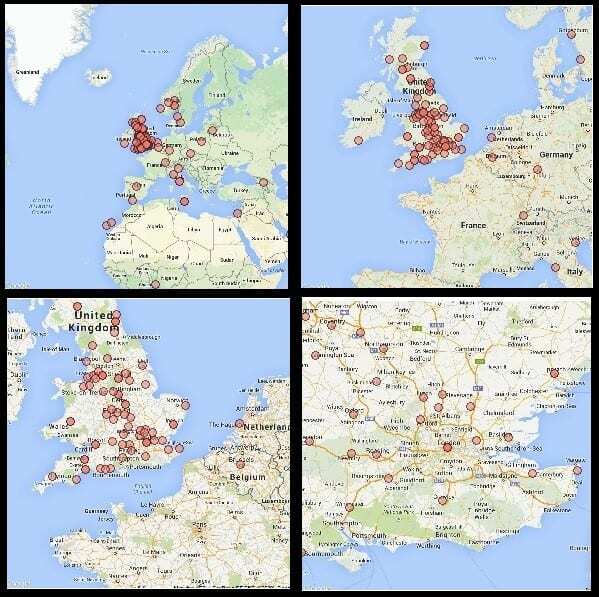 Most of the customers are from the UK, and within UK they are from all over the country. We do not have their address or postal codes which can be used to identify which are the customer who live within a close distance to the store. All the reviewers do not share their location, hence this chart only marks the reviewers who mention their city in their profile. An initial analysis of all the reviews throw up the following Wordcloud. 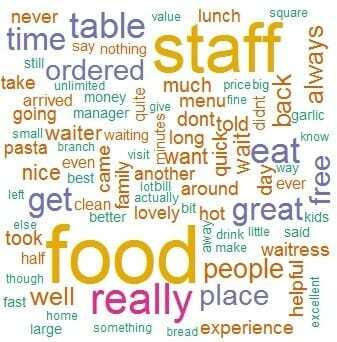 The customers are talking about a lot of things, but from this Wordcloud we can’t say if the customer who is talking about ‘service’ has a positive feedback or a negative feedback. Most of the customers are talking about ‘Food’ and ‘Staff’. A deeper analysis of the reviews throw up much insightful results than the overall picture. 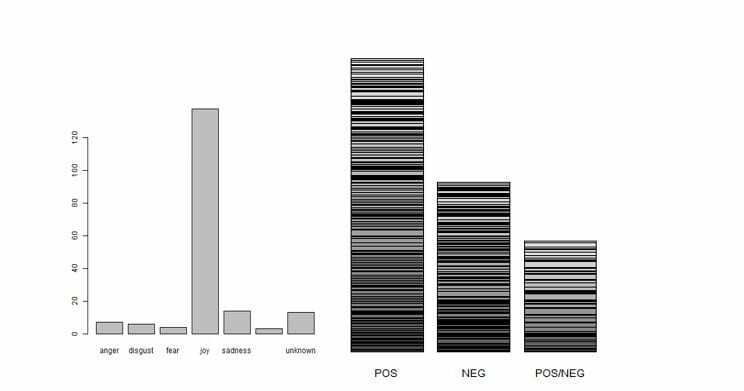 The emotions and polarity are calculated based on the Naive Bayes Text Classification Algorithm which classifies the emotions as “joy”, “anger”, “sadness”, “disgust”, “fear” etc. The polarity of the text (positive/negative/neutral) is assessed based on the degree of emotion by assigning a numeric to it (ranging from -3 to +3) and then summing them up over the sentence to account for contradicting statements (example: “The food is excellent but the service is pathetic”). This analysis shows that the customers are most happy about food, staff, salad and services and have written a positive review about this store mentioning these. 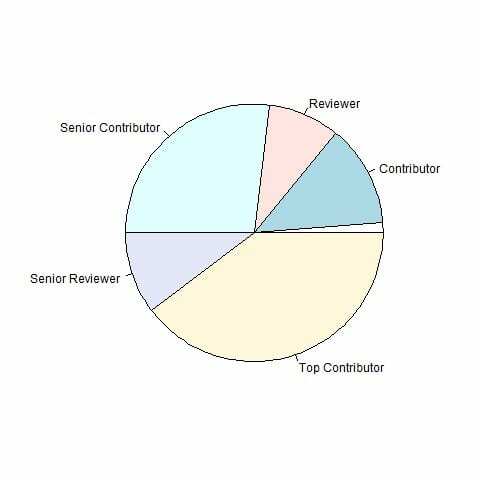 The chart shows that ‘Top Contributors’ and ‘Senior Contributors’ form a bulk of these positive reviewers which is a good thing, as people rely on the reviews given by these people and they have more influence than an one-off rating provider. The word “Bill” occurs most frequently in the negative reviews indicating that the negative reviewers are most unhappy by the “Bill”. The store needs to look into this issue, maybe by improving turnaround time for providing Bill to the customers, or checking the accuracy of Bills. This is followed by “Staff” and “Waitress”, indicating customers have issues with the staff of the store. 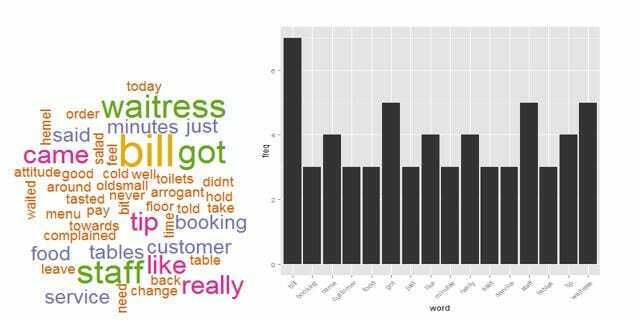 A further drill down is possible which makes use of Word Correlation which identifies how frequently the words come together in a text. For example, “Bill” could be having a strong correlation with “Late” or “Inaccurate”, which can be used to identify the exact issue. 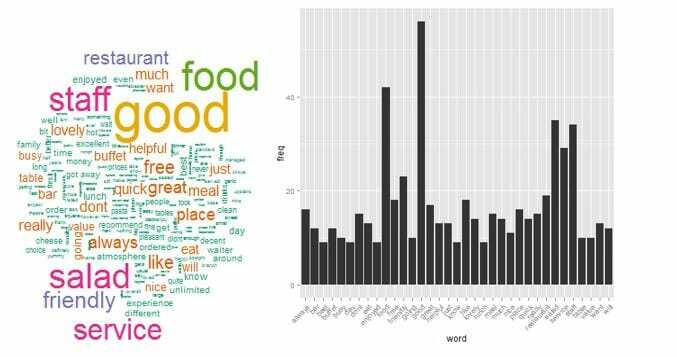 This analysis does not include words correlation since the data size is a bit small, and a larger data set will be used to identify words correlation correctly. Since the data is small, the Store can directly look into these negative reviews to see why these customers are unhappy. A major question about Automated Text Mining is the accuracy of results. As mentioned earlier, algorithm based text classification does not claim to be (and cannot be) 100% accurate as compared to Human Interpretation which is a bit subjective. However, these algorithms provide an accuracy level of 70-80% which is fairly acceptable for an automated analysis. In this case, since the data is pretty small, it was possible to go through the classification manually, and compare the algorithmic sentiment classification with the manually interpreted classification by reading the comments. The negative reviews are 81% accurate and the positive reviews are 88% accurate. The overall accuracy will go down a bit since ambiguous reviews (“Pizza is good but Garlic bread is not good”) will be flagged as neutral. Still a good amount of accuracy for an Automated Model for positive/negative classification! The CRS has its own positive and negative sides. You need to have a good amount of data to analyze, and it should be generalized (not collected from a single source). A very good way to enrich the data is to include the feedback from other social media channels like Twitter. If the reviews are available on any medium, CRS is a much more analytically advanced way to measure the customer satisfaction score rather than the single-metric NPS. The results obtained from CRS can be further broken down by store, by country, by user age group (if we have the information), or any other data available. This has huge potential not only for Restaurants, but also for businesses where customer satisfaction is a very important part of business. Hotels and Resorts (for which a lot of customers write reviews) can understand more about customer feedback and take necessary action based on insights. Airlines can understand the key issues that the customers face based on different locations/airports or type of aircraft. Wherever there is user generated data, the CRS can be a good tool to understand your customers. Ashutosh Kumar is the a Vice President – Analytics of Capillary Technologies Pvt. Ltd. At Capillary he focus on the UK & USA market and providing analytics based solutions to the retailers, apart from exploring new verticals for deploying Capillary’s analytical solutions. Before Capillary he has worked with dunnhumby UK for the UK retail market. He is a graduate of IIT Kharagpur, and his hobbies include photography, travelling, and being up to date with latest technology and gadgets.